Address:Lac Long Quan street, Tan Thinh block, Cam An ward, Hoi An town, Quang Nam province. 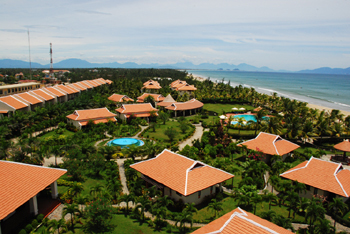 Welcome to Hoi An Beach Resort of Agribank! The Resort provides features of your home away from home. It has all the features that can connect you to people. The tranquile atmosphere combined with recreational activity enhances your health – physically, spiritually and emotionally. A great place for people who wants a holiday break away from busy life. Main Restaurant: Our restaurant can seat as many as 350 diners, with a wide choice of Western and Asian dishes, includes Hoi An specialties: Cau Lau, Hoanh Thanh, Banh Bao, Banh Vac, Mi Quang, and to name a few. Ocean Pool Bar: Enjoy your sip of your favourite drinks at the Ocean Pool Bar. Garden Snack Bar: Relax and enjoy your drinks and snacks at the Garden Snack Bar next to the swimming pool and overlooking the beach. Fully enclosed air-conditioned hall designed for large conferences which has a seating capacity of 350 (theater type), equipped with modern facilities, complete with audio-visual equipment. It’s a multi-function hall convertible to all types of occasions. Tables and seating arrangement can be set-up according to conference / meeting requirement. Swimming pool provides an atmosphere of recreation, relaxation and entertainment. The Bar is right within the pool where you can conveniently settle for a drink. Occassionally, we provide dine-in with entertainment at night. Copyright © 2003 - 2014 Vietnam Hotels and Reservation Vietnamhotels.biz .